The English art-rock band Alt-J constructs songs like it is trying to finish an argument. Every element is applied methodically and with irrefutable logic. On Alt-J’s latest LP, This Is All Yours, the guitar and keyboard parts are understated — they just sort of hang there, like dry ice. They might appear to be ineffectual, but then you notice how the wan musical window dressing allows Alt-J’s (surprisingly) excellent drummer to make grand entrances and dramatically raise the emotional temperature at each song’s midpoint, a predictable but undeniably effective demonstration of dynamics. Then there are the lyrics, a muddled litany of fanciful gobbledygook — to quote one of the more memorable lines, “I’m gonna bed into you like a cat beds into a beanbag.” And yet, because said gobbledygook is reduced to an indecipherable warble by the group’s sad-elf vocalist, it also achieves a kind of grandeur. A song need not articulate a message more profound than “hey!” or “whoa-oh!” and there are a lot of hearty heys and whoa-ohs in Alt-J songs. By the end of each track, Alt-J has intricately laid out a convincing case for the listener to feel something. If you’re not moved, you better have a strong rebuttal. Alt-J is currently bigger in its home country than it is here — so big that after its 2012 debut, An Awesome Wave, won the U.K.’s prestigious Mercury Prize and sold one million copies worldwide, an Alt-J backlash started to brew. Alt-J was swiftly dismissed with the usual epithets affixed to ascendant, overly studious rock groups whose members resemble disheveled IT drones — “bland,” “boring,” “normal.” The scrutiny and accompanying career pressures have been blamed for the departure of founding bassist/guitarist Gwil Sainsbury in January. But the remaining members of Alt-J are prepared to win the “normal” argument as well. “I quite like people thinking that we’re normal, cos we are,” drummer Thom Green recently insisted to the Guardian. “… To me, the coolest bands are Portishead and Radiohead, who are completely normal.” Like I said, logic. Stateside, there are signs that Alt-J is making inroads: The group’s highest-profile fan is Miley Cyrus, who incorporated Wave’s catchiest song, “Fitzpleasure,” into a set piece for her Bangerz tour. After offering to remix her song “4×4,” Alt-J sampled Cyrus’s vocal on “Hunger of the Pine,” a smoldering, slow-building standout on the new record. Actually, describing an Alt-J song as “slow-building” might be redundant — even more than the debut, Yours favors deliberate, ponderous pacing and slow-release hooks that sink in over multiple listens. Alt-J conceives its albums as brainy, multipart suites that are consciously presented as high-art installations. Sometimes this means Alt-J takes forever to get to the point: Just as Wave opened with “Intro” and then segued into one of several “Interlude” tracks, Yours is heavy on the throat-clearing. For instance, there’s a four-minute song called “Arrival in Nara” that announces the arrival of the next track, “Nara,” which then points to the album-closing “Leaving Nara.” At times it’s not clear whether Yours is a concept record or a series of GPS directions for navigating the south-central region of Japan. No matter its high-minded affectations, Alt-J is just as calculating when it comes to fortifying its commercial prospects as it is with building majestic cathedrals of murmuring, maximalist Muzak. Along with the promotional coup of a Miley cameo, Alt-J went along with its American record company’s request for a grabby radio single by producing “Left Hand Free,” an uncharacteristically bluesy and thoroughly junky toss-off with a riff made to soundtrack a Chili’s menu and a hilariously inept organ solo that suggests Alt-J either has a very dry sense of humor or owes an apology to the Black Keys for unintentionally ripping off and inadvertently satirizing Turn Blue. “Left Hand Free” seems destined to become Alt-J’s “Creep” — the popular favorite that is subsequently never played in concert. (Though, to be clear, “Creep” is a much better song.) Yours’s other early single, “Every Other Freckle,” which I hear constantly whenever I’m tuned to satellite radio, is more representative of the album and Alt-J overall, with its addictively buzzing synths, big drums, and choir of angelic aliens belting heavenly harmonies. It’s what I imagine Imagine Dragons’s inevitable “experimental” period will sound like. By the way, Alt-J slagged “Left Hand Free” in that Guardian interview — “I tried to make the drums as clichéd as possible,” Green said, which is a very British drummer thing to say — so if the song hits, Alt-J can enjoy the spoils of a crappy radio hit while holding it at arm’s length. Like I said, methodical. While listening to This Is All Yours, I couldn’t help but fixate on a word I try not to use much anymore: indie. It sounds indie in a way that most records of its ilk don’t anymore. Surely, there are still artists who choose to operate on the fringes, forgoing commercial rewards in the pursuit of singular, idiosyncratic artistic visions. But as a word used in the common parlance to separate a large subset of semi-popular artists from a smaller body of popular pop artists, “indie” feels awfully extraneous in the post-Haim era. If there’s any daylight between these two groups, it seems now to be more of a matter of success or failure in the marketplace than aesthetic design. Of course, it’s possible that whether it was used as a noun or an adjective, indie never had much meaning — it has been used incongruously to denote business independence for bands signed to major labels, artistic outsiderdom for artists embraced by the mainstream, and hip cachet for marketers cravenly pushing products on young, urban, corporate-mandated demographics. But as imprecise if convenient shorthand, indie used to be semi-useful as a descriptor of a certain sound. Indie still evokes a set of polarizing musical signifiers: folk-based, prog-influenced, punk-affiliated, ultimately pop-friendly but initially difficult-seeming and non-immediate. Perhaps that description makes you feel warmly nostalgic for your non-married, non-parenthood years. Maybe it makes you want to punch a bearded barista in the face. Either way, that version of indie no longer accurately represents whatever we’re calling music for college-educated, upwardly mobile, predominantly white listeners now. The last time indie truly lived up to the indie caricature was 2009, the year of Merriweather Post Pavilion by Animal Collective, Bitte Orca by Dirty Projectors, and Veckatimest by Grizzly Bear. I realize that it might seem strange to write about the relatively recent past as if it were ancient history. It’s also worth acknowledging that the aforementioned bands are still active and more than capable of continuing to produce great albums. You could go one step further and assert that the fusion of electronic music and R&B with knotty folk-rock that distinguishes those LPs contributed to the DNA of current tastemaker fodder like FKA twigs and How to Dress Well. It certainly appears to have also influenced This Is All Yours, which might as well be called Merriweather Bitte Veckatimest Pavilion. The difference between Alt-J and indie’s class of 2009 is the element of surprise — before those albums were codified by legions of imitators, they seemed bracingly original and legitimately forward-thinking. In the case of Alt-J, the appropriation of classic indie tropes is akin to the modern flash Eric Clapton supplied to ancient Robert Johnson songs, though Yours can’t successfully rescue every late-aughties anachronism. For instance, it used to be relatively commonplace for an indie band to put a flute solo on an album; when Alt-J deploys softly trilling pipe music at the heart of This Is All Yours (for an instrumental snootily titled “Garden of England,” no less), the preciousness is almost too potent for contemporary palates. What once conveyed elegance now seems cartoonishly stuffy, like wearing a monocle. Alt-J sticks its landing more squarely on “The Gospel of John Hurt,” an oddball electro-folk anthem inspired by the stomach evacuation scene from Alien, which swells from irregular guitar-picking and digitally distorted vocal burbles to a stately death march buoyed by a steady, finger-snap pulse. Wherever Daniel Rossen is, he might want to double-check his archives for pilfered demos. Perhaps the truest comparison for Alt-J isn’t Grizzly Bear or Radiohead but another buzzy British outfit slavishly devoted to reinvigorating faded traditions, Mumford & Sons. 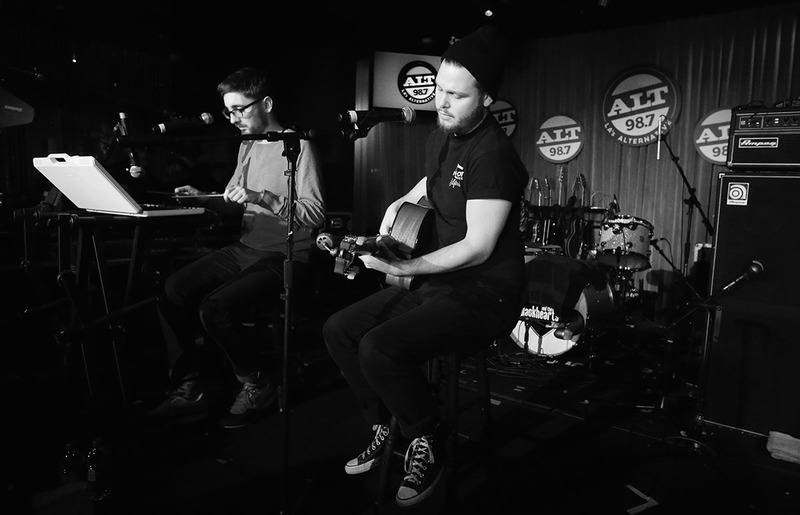 Like Mumford, Alt-J is a superficially quirky and preternaturally disciplined pop act. Both bands write formally perfect songs — they may, in fact, be secretly Swedish, or have access to a room of chain-smoking Swedish monkeys banging out hits behind typewriters. They’re also similarly oppressive. The reason why perfection is difficult to dispute is because it’s impenetrable. Perfection doesn’t allow for dispute. This Is All Yours doesn’t offer any personal access points; it merely dictates a set of predetermined reactions. By the end of the album, you’ll be too tired to argue. You may, instead, just want to go to sleep.